Are You Looking For Spare Parts from Japan ? Many fully functional auto-parts are found on Japanese used cars, which are very much in demand as spare parts for the overseas market as well as in the domestic market. All appropriate car parts are carefully selected by professionals. 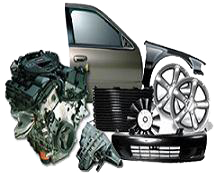 You can order all type of Used Car parts, Auto Body Parts, Rebuilt Auto Parts, Refurbished Auto Parts, Auto Electrical Parts, Engine Parts of all types of makes.